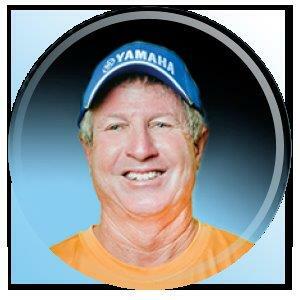 Captain Jimbo Thomas is a native Miamian who grew up fishing the inshore and offshore waters of South Florida and the Bahamas. Jimbo has been a full time charter captain and has owned and operated the 42ft sportfish “Thomas Flyer” out of Downtown Miami’s Pier 5 for over 30 years with his brother Rick. Captain Jimbo specializes in offshore and reef fishing for Sailfish, Mahi, Kingfish, Tuna, Wahoo and many other species. The “Thomas Flyer” is a regular in the South Florida Fishing Tournament Circuit – having placed in many of them over the years. Captain Jimbo and the “Thomas Flyer” have been featured in many magazines including Sport Fishing, Marlin, Salt Water Sportsman and Florida Sportsman and has done numerous TV shows with Rick Murphy, Roland Martin, Jimmy Houston, Buck McNeely and others. Captain Jimbo serves on the board of the Yamaha Contender Miami Billfish Tournament and is also very active in conservation, having tagged the most sailfish of any captain in the Atlantic and is a top Dolphin tagger for the Dolphin Tagging Research Project. Sponsors include Daiwa, Leeward Rods, Admiral Oil, Costa del Mar Sunglasses, Mustad, Rapala, Hook & Tackle, Hook Up Lures, Bass Assassin and Simrad.